This summer drinking coconut water became the thing to do. It was everywhere, in gyms, supermarkets, health food stores, train stations, even corner shops. It was one helluva take over. I myself, was swigging it non stop in the 3 months I was doing Stepping Out (a dance show) which was very thirsty business. It’s more hydrating than water we were told. It’s full of nutrients etc. I also had started cooking with coconut oil instead of my usual olive oil because it’s much more stable and less toxic at high temperatures. And then I read an article that said that coconut water was full of sugar, not that good for you and was all a big hype. What?? Surely that must be a mistake? Coconut is one of the world’s most versatile and natural products. The brown hairy egg-shaped coconut sold in the supermarket is actually the seed of the fruit of the coconut palm tree. 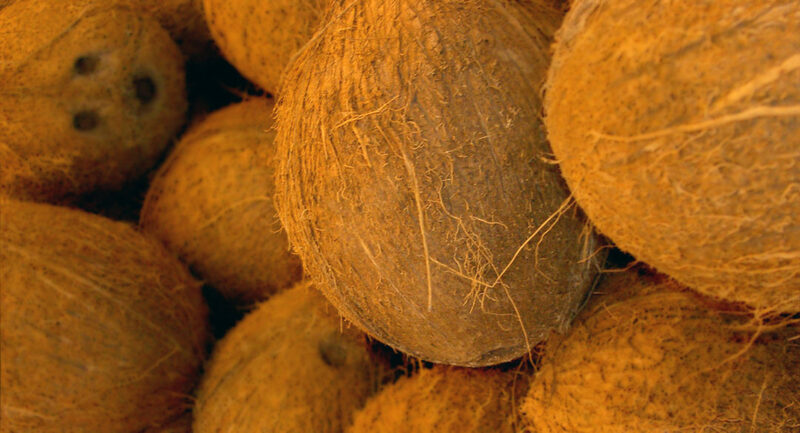 These are mature coconuts that provide us with dried coconut flesh, creamed coconut, canned coconut milk and coconut oil. 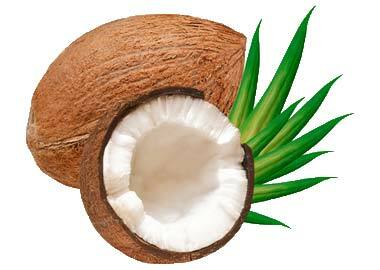 Major producers are the Philippines, India and Indonesia where coconut products serve as a dietary staple. In Thailand, where coconut appears in virtually every national dish, the coconut palm is called ‘the tree of life’ due to its health giving properties. Of all the coconut products mentioned above, coconut water and coconut oil are currently enjoying fame over here as the new super foods – let’s see why. Coconut water, a product that has fairly recently flooded the market, comes from young green coconuts that are harvested when the flesh inside is soft and rubbery. In tropical countries such as Brazil, it has been served on beaches in its natural form for years. Nowadays it is packaged up and consumed worldwide – its popularity soaring because of its natural isotonic properties. According to The American Journal of Emergency Medicine, it has an electrolyte composition that is perfect to be used intravenously in remote parts of the globe where there may not be saline solution available. Sports people are therefore choosing it over their more artificial electrolyte sports energy drinks. Its natural sugars provide energy and it is bursting with vitamins and minerals including calcium, potassium, magnesium and zinc. Use it for cooking your rice, it adds a wonderful subtle flavour, or even for braising meat. Be aware, however, that it does contain calories due to the fairly high sugar content which comprises around seventy-five percent glucose and twenty-five percent fructose. It should never be considered a water replacement. Coconut oil is a fat that confers many health benefits and may even be used as an aid to weight loss. It is rich in lauric acid which is a medium chain fatty acid – this means that it is immediately converted into energy rather than being stored as fat. Lauric acid is a health-promoting fat that is abundantly found in breastmilk. It is converted into a compound called monolaurin that can destroy viruses such as herpes simplex and HIV. Monolaurin deactivates pathogenic bacteria including helicobacter pylori and MRSA. It can also kill a number of fungi and yeasts such as candida albicans. Other benefits include a healthy cardiovascular system, healthy brain function, better thyroid function, a stronger immune system and the list goes on. Stir a spoonful in your coffee in the morning or use it for light frying and baking because, unlike olive oil, it stays fairly stable even when heated to high temperatures. Rub it onto your skin as a moisturiser. It can even be used instead of shaving cream, acting as an antiseptic if there are any cuts.